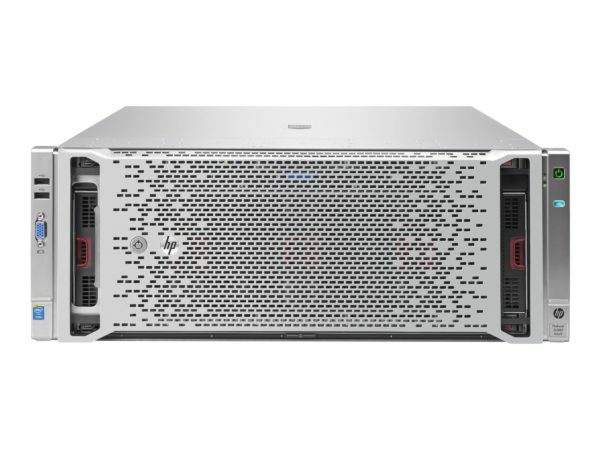 The HPE ProLiant DL580 Gen9 Server from Hewlett Packard Enterprise provides a reliable data protection and security with enhanced processor performance and speed. With 4S enterprise standard x86 server HPE ProLiant DL580 Gen9 Server is now offering up to 6 TB of memory, greater I/O bandwidth (9 PCIe 3.0 slots), and 12 Gb/s of SAS speeds. The HPE DL580 Gen9 Server maximise system availability and allows extensive error recovery and diagnosis with built -in- redundancy. The HPE DL580 Gen9 Server supports improved ambient temperature ASHRAE A3 and A4 standards. Increase in processor performance with Intel Xeon E7-4800/8800 v4/v3 processors. Flexibility of networking bandwidth and with nine full-length/full-height PCIe 3.0 slots allows to choose the optimal 12 Gb/s SAS controller also prevents Data loss. The DL580 Gen9 Server from Hewlett Packard Enterprise Supports ambient temperature ASHRAE A3 and A4 standards. HPE OneView Management console provides a personalized support and monitoring with HPE Insight online for automation simplicity across servers, storage and networking with HPE DL580 Gen9 Server .